John Cooney is an experienced practitioner in the areas of natural resources law, antitrust law, class action defense, eminent domain and other areas of complex commercial litigation and arbitration. John has more than forty years’ experience, and has served as lead counsel in a wide variety of matters including natural gas contract disputes, mineral title disputes, royalty disputes, class actions, taxation of natural resources, and antitrust cases. He has represented clients including small independent oil and gas producers, and large international corporations, and has presented oral arguments in the United States Supreme Court. 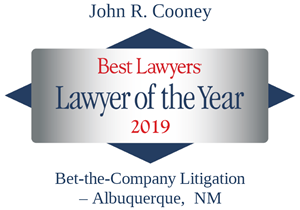 A Fellow in the American College of Trial Lawyers, and former President of the State Bar of New Mexico, John was named 2019 Bet-the-Company Litigation “Lawyer of the Year” in Albuquerque by Best Lawyers in America®, where he has also been recognized in the areas of Antitrust Law, Commercial Litigation, Energy Law, Mining Law, Natural Resources Law, and Oil & Gas Law. 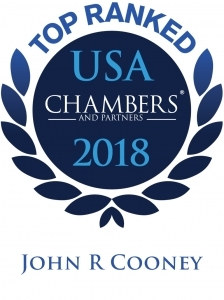 Chambers USA reports, “Cooney’s at the top of his game. He’s very professional, hard-working and successful. 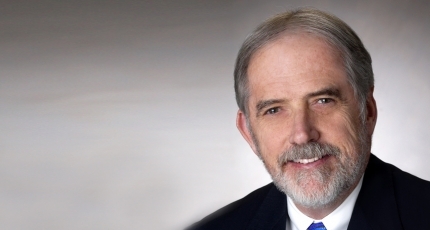 He’s the real deal.” John is among those listed in Southwest Super Lawyers® and has been recognized among the Top 25 New Mexico Super Lawyers for the past 12 consecutive years, from 2007 through 2018. John was admitted to law school as a junior in college and received dual degrees in 1965. He served as President and Chair of the Executive Committee of Modrall Sperling from 1993-2000. He serves as Co-Chair of the Oil and Gas Industry Service Group and is a member of the firm’s Natural Resources & Environment Department. Represented Santa Fe Industries and related companies defending against claims of federal and state antitrust violations and fraud, settled after summary jury trial in 1990 after eleven years of litigation in federal courts in New Mexico and Texas. Texas Utilities Company, et al. v. Santa Fe Industries, Inc., et al. Represented Amoco Production Company in case involving power of Tribes to tax natural resources production; argued in United States Supreme Court, Merrion v. Jicarilla Tribe, 455 U.S. 130. Lead counsel for San Juan Coal Company (SJCC), a New Mexico coal producer, in a two-week arbitration hearing in 2014 involving cost reimbursement claims under a coal supply agreement; opposing parties were Public Service Company of New Mexico and Tucson Electric Power Company. The arbitration resulted in an award in favor of SJCC awarding SJCC $5.2 million in disputed claims, and rejecting the Utilities’ claims for $13.9 million in reimbursements. Lead counsel representing Tri-State Generation and Transmission Association, Inc., an electric transmission and generation cooperative in an appeal from an order entered by the New Mexico Public Regulation Commission, resulting in a New Mexico Supreme Court opinion ruling in favor of Tri-State. See Tri-State Generation and Transmission Association, Inc. v. New Mexico Public Regulation Commission and Kit Carson Electric Cooperative, Inc., 2015-NMSC-013, 347 P.3d 274. Lead counsel for Tri-State Generation and Transmission Association, Inc. in obtaining affirmance by the United States Court of Appeals for the 10th Circuit, of an order denying intervention. See Tri-State Generation and Transmission Association, Inc. v. New Mexico Public Regulation Commission, et al., 787 F.3d 1068 (10th Cir. 2015). Represented Conoco Inc., Chevron USA Inc., and other oil companies defending title claim to 70-year old oil producing property, obtained summary judgment for defendants, affirmed. See Fred R. Skaggs, et al. v. Conoco Inc., et al., 125 N.M. 97, 1998-NMCA-061. Represented national associations, local suppliers and contractors challenging City of Albuquerque’s “Green Building Code” based on claims of federal preemption. Obtained summary judgment for clients. See The Air Conditioning, Heating and Refrigeration Institute, et al. v. City of Albuquerque, No. CIV-08- 633, United States District Court, District of New Mexico. Represented natural gas producers in natural gas contract arbitration, Conoco Inc. and Amoco Production Co. v. Sunterra Gas Gathering Company, et al., U.S.D.C. N.M. CIV 90-214. Represented condemnor in eminent domain case, Colfax County District Court, New Mexico, two week jury trial in January, 1996, Tri-State Generation and Transmission Association, Inc. v. King et al. Represented Amoco Production Co. in putative class action alleging underpayment of royalties, obtained summary judgment for Defendants, appeal dismissed. See San Juan 1990-A et al. v. Amoco Production Co., 2002-NMCA-041, 132 N.M. 73, 43 P.2d 1083. Represented Amoco Production Company in class action alleging underpayment of royalties, 3 week trial in 2002, settled after trial. See Parry et al. v. Amoco Production Co., State of Colorado, County of La Plata, District Court No. 94 CV 105. Acted as an arbitrator in commercial arbitration matters.